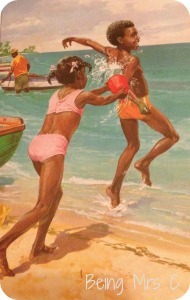 Do you know what one of my smartest moves ever was in collecting Ladybird books? Realising that Danny from Clouds in my Coffee goes to loads of jumble sales and the like and that he’s fab at seeking out Ladybird books! When I heard he was off to a car boot sale on Sunday I cheekily reminded him to keep a look out for me and I was therefore somewhat delighted when he sent me this picture asking if there was anything I could see that I wanted. At just 30p each I’m delighted to say that several came home to me and even more delighted that I took the effort to zoom in and notice one title that I’d not heard of before. 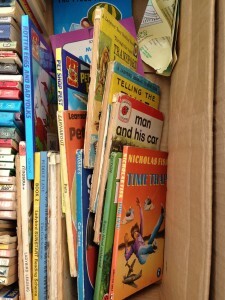 There in the bottom left of the photo is a yellow spine with the words “Book 2 Ladybird SUNSTART Reading Scheme” on it. Now at this point I should say that I didn’t have a foggiest what the Sunstart reading scheme was, but I was intrigued to find out. 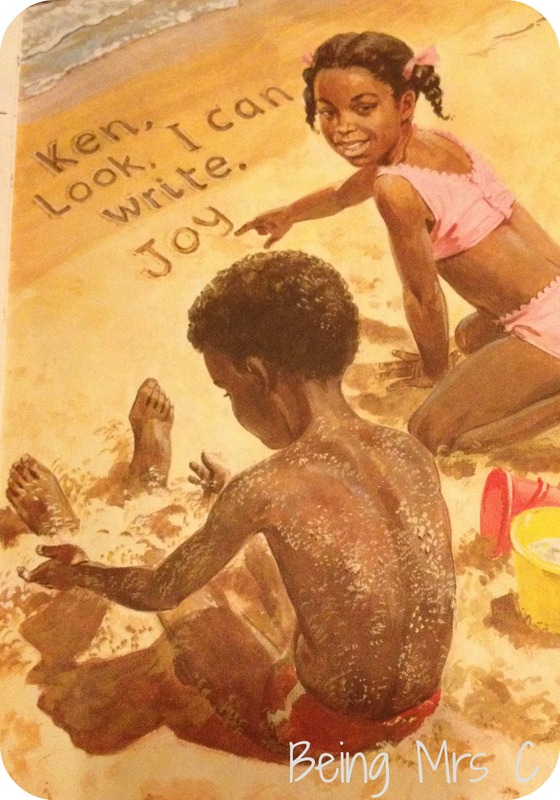 Book 2 of the Sunstart reading scheme is called On the Beach and features two children called Ken and Joy. The books is very much of the style of the Ladybird Keyword reading scheme but it was obvious from the introduction that this was a bit different. 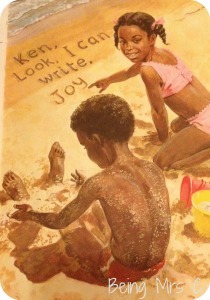 This most certainly wasn’t Peter and Jane that I knew from my childhood here in England. The book is written by well known Ladybird author W. Murray and illustrated by Martin Aitchison who was responsible for so many of the classic Ladybird books that we all remember from our childhood. A spot of internet research on the Sunstart reading scheme didn’t throw up many answers other than this page on Martin Aitchison’s website. 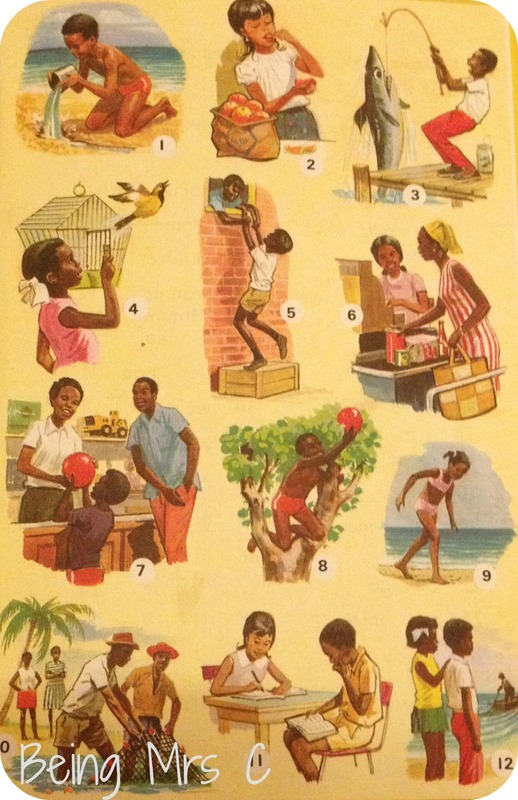 It seems that in the mid-1970s a decision was taken to launch a new version of the Ladybird reading scheme specifically for children in the West Indies. 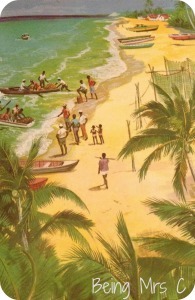 Both the author and illustrator went out to the West Indies as part of the preparation for the book and photos were taken in Trinidad, Jamaica and the Bahamas as a basis for the illustrations. 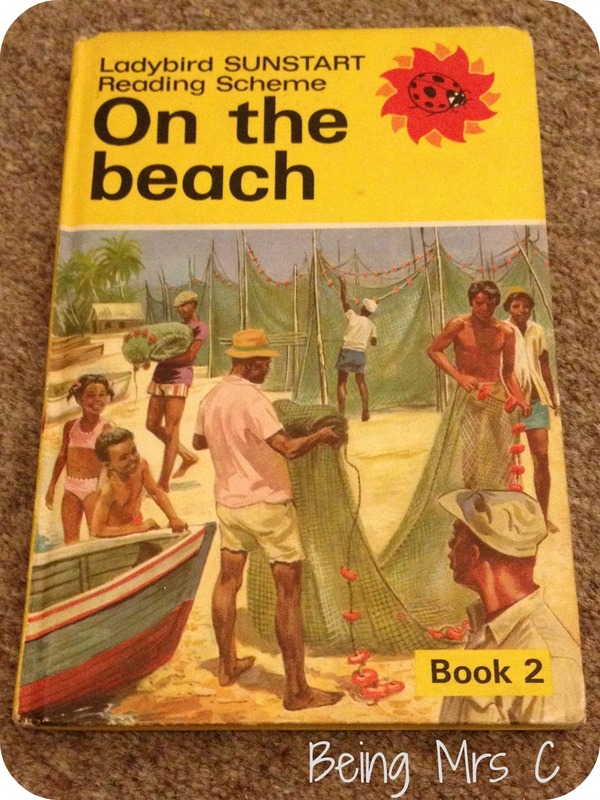 The Sunstart Reading Scheme was published as Ladybird series 747 and consisted of 6 books in total. Accompanying them were three workbooks and classroom resources of Flash Cards and wall pictures. 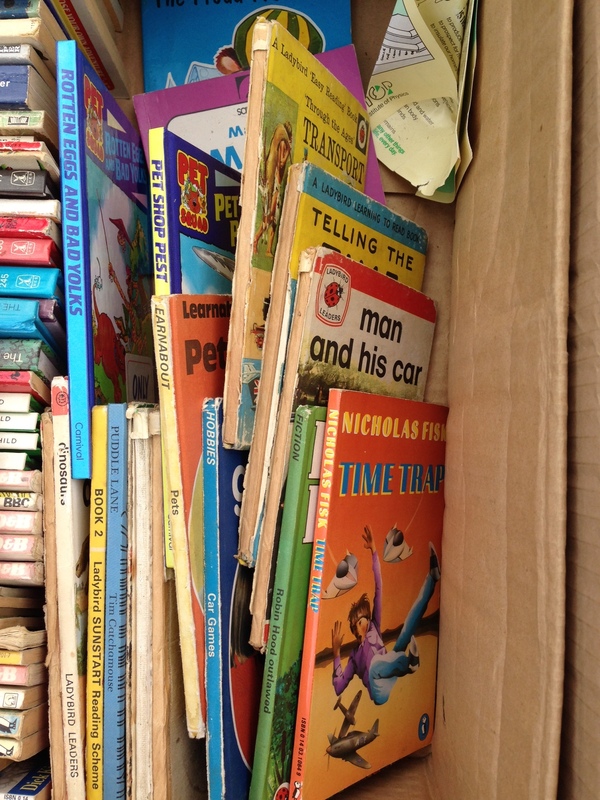 Looking at Ladybird’s own website it seems that a modern version of these books and workbooks is still available, as is an online copy of A Guide to the teaching of Reading using the Ladybird Sunstart Reading Scheme. I’d not come across any of these Sunstart books before and a quick look on eBay suggests there aren’t all that many about. I’ve no idea how many of them were published, or how many of them were sold here in the UK versus over in the West Indies. Certainly I wouldn’t have expected one to turn up at a car boot sale in Hatfield. I’ve been chatting to Helen from Ladybird Flyaway Home (the biggest collector of Ladybird books ever!) over on twitter about them and she thought that they weren’t a commercial success as they overestimated the market somewhat, so I’m therefore a bit surprised to see that they’re still being published. The artwork is certainly excellent, as much of Martin Aitchison’s is, and it’s strange to see the familiar Peter and Jane style being used with two different children in a very different setting. On the Beach shows Ken and Joy spending a day on the beach where they not only play in the sand and water, but also watch the fishermen go out in their small boats with their nets before coming back to the beach and selling the fish straight from the boat to the women who flock around it. Completely different to a day at a English seaside town! It goes to show that even as someone who’s been collecting Ladybird books for a while now there’s still plenty out there for me to learn about and new series to discover. So huge thanks to Danny for this particular discover. 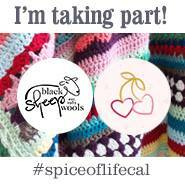 Coffee’s definitely on me the next time we meet up! 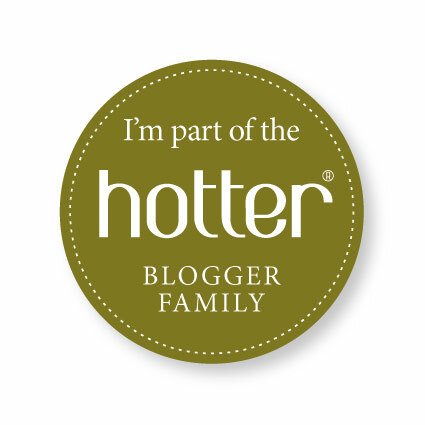 Wow, that is really fascinating, thanks for sharing! I do love the artwork in the book. I’m joining in this week with The Motor Car http://www.jenniferslittleworld.com/2014/09/ladybird-tuesday-motor-car.html I do seem to have picked a lot of complicated ones lately, I have a few lighter ones lined up though! This is a comment/request. My 37 year old daughter learn to read starting at age 4 with the Ladybird Sunstart Series back during the mid-1980’s. The series came with Books 1 – 6 and Workbooks A, B and C. The books have been passed down to her daughter (our granddaughter), but we haven’t had any success in finding the workbooks (A, B and C). That’s my comment. MY QUESTION: Can you assist me in obtaining the three (3) workbooks for the Sunstart series.